Kim Joon, Bird Land-Donald Duck, 2008, digital print, 47 x 47 inches / 94 x 94 cm., Edition 2/5. Kim Joon, Bird Land-Aerosmith, 2008, digital print, 47 x 47 inches / 94 x 94 cm., Edition 5/5. Hosook Kang, Water, 2011, acrylic on canvas, 60 x 60 inches / 152.4 x 152.4 cm. Hosook Kang, Expansion 6, 2014, acrylic on canvas, 48 x 96 inches / 122 x 243.8 cm. Kim Joon, Cradle Song- Ferragamo, 2009, digital print, 63 x 31 inches / 160 x 78.7 cm., Edition 2/5. Kim Joon, Fragile-Holy Plants, 2010, digital print, 47 x 66 inches / 119.4 x 167.6 cm., Edition 4/5. Hosook Kang, Pond, 2014, acrylic on canvas, 53 x 69 inches / 134.6 x 175.3 cm. 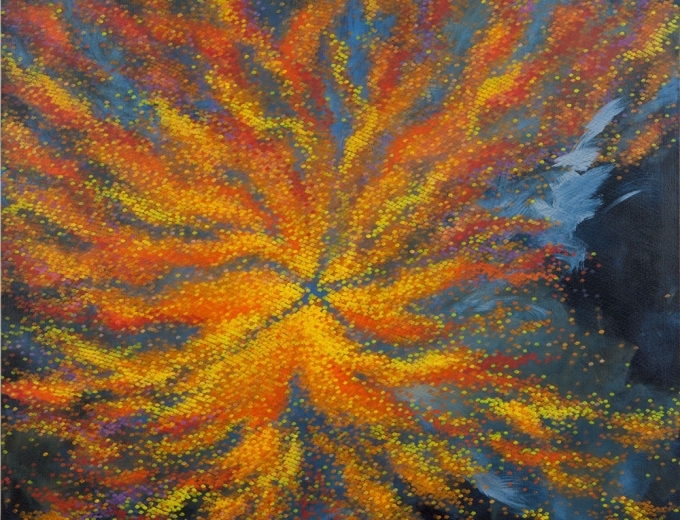 Hosook Kang, Flame, 2011, acrylic on canvas, 60 x 60 inches / 152.4 x 152.4 cm. Kim Joon, Golden Hour-Maria, 2011, digital print, 27.5 x 47 inches / 69.9 x 119.4 cm., Edition 4/5. Kim Joon, Moet Chandon, 2011, digital print, 82.7 x 47 inches / 210 x 119.4 cm., Edition 1/5. Hosook Kang, Alchemy 12, 2010, acrylic on canvas, 60 x 60 inches / 152.4 x 152.4 cm. Hosook Kang, Steel, 2011, acrylic on canvas, 60 x 60 inches / 152.4 x 152.4 cm.